Getting a super cute baby Christmas picture is a big deal. 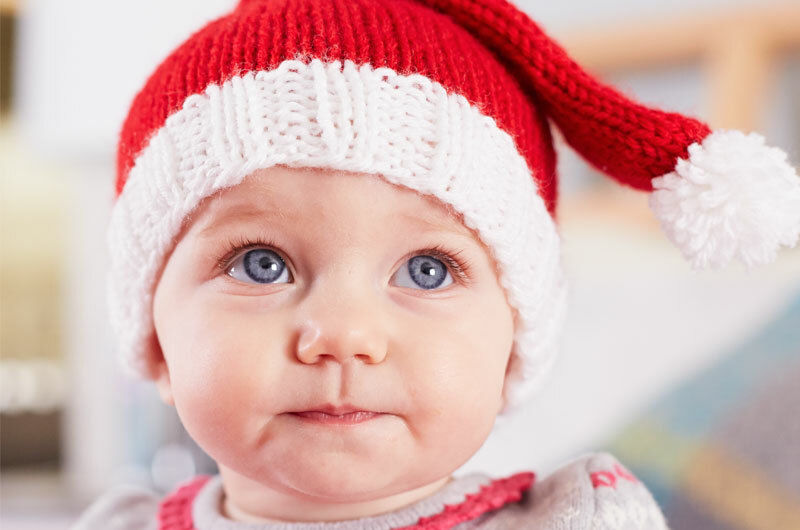 Whether you’re planning your photo Christmas cards or just want to document the pure sweetness of your little angel, Hallmark photographer Jane Kortright’s tips guarantee maximum holiday cuteness. Here’s the low down seven Santa-approved baby Christmas picture ideas as well as seven fun photo props for baby’s first holiday photo shoot. Head for a Christmas tree farm, and corral your little one in a washtub or wooden crate lined with blankets. Put it in the space between trees, and shoot down the rows. If you can, find a place that will let you early in the morning—or shoot at dusk—for the best light. You can also get sweet shots of parents and baby checking out individual trees. Let Baby fall asleep on a chair, blanket, or sheepskin. 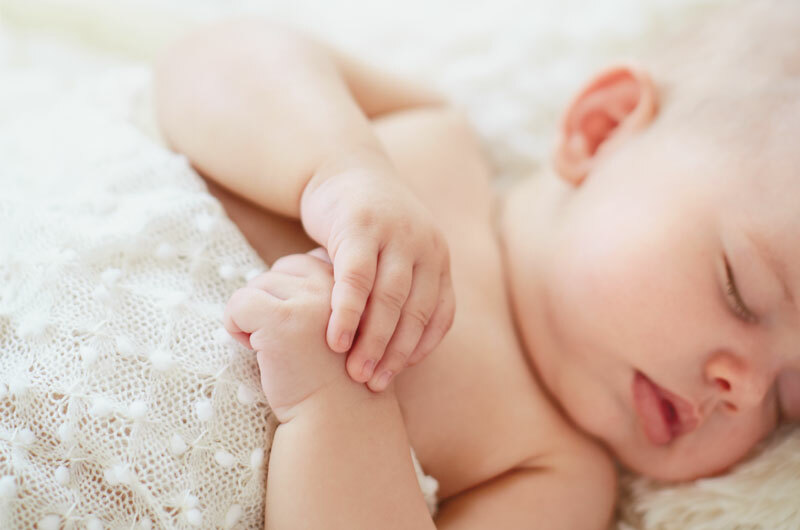 Play with the contrast between the baby’s outfit and the blanket: One simple, the other graphic, complementary colors and patterns, or a diapered or naked baby on a fluffy background. Try shooting from overhead, or getting all the way down on Baby’s level to get details. Maybe add props—like a plate of cookies and milk—so it looks like baby fell asleep waiting for Santa. Sit your little one in an open-topped, gift-wrapped box under the tree. Or surround your baby with presents, or stage a Christmas morning shot with torn wrapping paper and ribbons. 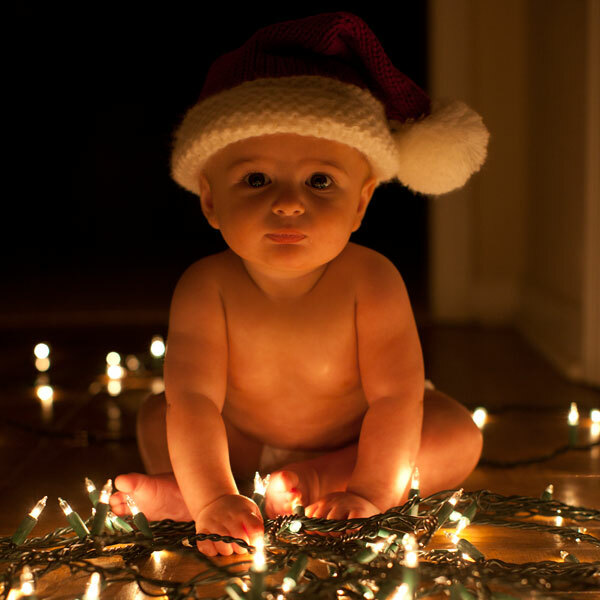 Put your baby on a blanket, light up the tree, and catch their reactions to the sparkly lights. Bring in family and furry friends—and those cute outfits or accessories. Have Mom hold the little one’s hands and help them stand between her legs. Sit on the floor, and keep the shots focused on the baby. Or get a close-up of Baby sleeping in Dad’s arms. Or deck the human baby and fur baby out in matching outfits or accessories. Want a cute picture of the whole family? Snuggle up on the couch get out your favorite Christmas book. Bonus points if everyone wears matching pajamas. We are not above putting toys—toys with squeakers and bells, even—inside the book to focus a tiny attention span. Stick a gift-wrap bow on Baby’s head. This is an easy one with super-adorable results. You can hold your photo shoot while you’re wrapping presents or wait for Christmas morning. Play with bow placement for maximum cuteness or hilarity. Try a jaunty angle, a low-over-the-eyebrow fascinator look, or top of the noggin. Version 1: The simpler, the better. This is about personality, not props. Let the Santa hat stand out: Dress the baby in a white onesie, diaper, or nothing at all. Version 2: Full North Pole treatment. Santa outfit or PJs. Pets, parents, or siblings in reindeer antlers. Propped with a sled. Get up close and play around. Capture giggles from the front, dimples in profile, and sweet silhouettes from behind. Adorable accessories: tutus, bow ties, reindeer antlers, scarfs, etc. LED lights: All white or multicolor. The more the better. Baby’s best friend: Add a the family pet to your picture to double down on holiday cuteness. Plain white onesie (or just diaper!) Let the backgrounds or accessories do the work. Blanket: Soft, fluffy sheepskin or blanket. Santa hat or full costume. Classic. Shoot when your baby is happy—in the morning, when they’re not hungry. Partner with a friend or family member—they can help you keep the baby’s attention. Use natural light or the soft glow of Christmas tree lights instead of a flash when you can. Play with your camera’s capabilities. The portrait or low-light settings on smart phones can give you great results. If you’ve got a good place to prop your tiny person up, great. But an overhead shot of baby on a blankie or chair will be just as cute—and let you see all the details of whatever adorable outfit they’re wearing. Get in close and focus on the details—tiny hands and feet, eyelashes, curls. Make a fool of yourself. Sing. Play patty-cake. Make faces. For some reason, babies think sneezing is hilarious. Saying “yaaaaaay!” and “Woop woop!” noises are also quite popular. A warm baby is a happy baby. BUT don’t stop if your subject gets fussy. For every darling “nice” picture, there’s an entertaining “naughty” one. When all else fails: Use cat toys—feathers on strings, in particular—to get your small human’s attention. For more tips from Hallmark’s photo studio, including camera settings and composition, check out our Christmas card photo ideas. We’ve got more tips for taking pictures of tiny models in our cute baby photo tip sheet. And our friends at Think.Make.Share have ideas for stylish and stress-free family photos.